Make sure you visit the gallery for more images and information on work we've done. Salvedge design is the name of an exciting furniture maker working to create individual, hand crafted pieces in a modern vernacular while staying true to a sustainability ethos. Commissioning furniture should be affordable but also fun so salvedge works closely with clients to realise the vision they didn’t always know they had! We use a lot of modern, 'green' or 'eco' materials such as bamboo board, Valchromat® and plywood but also have experience with more traditional British and European certified hardwoods. However we will not work with tropical materials unless they come from a recycled source. This is an impossible question to answer as each client, and so each piece is different. However it is not prohibitative. Prices are unlikely to lie outside the range of those from a good high street store such as Heal's or John Lewis. Plus you will get exactly what you were looking for to fit your space perfectly! Please get in touch and ask the question. It's wedding season! We're happy to be working on two separate wedding gifts. 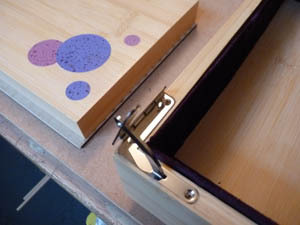 The final fittings are going onto a very personalised box for a ceremony this month.